The most prolific composer of waltzes for the Broadway theater was Richard Rodgers, who wrote ten of the entries on Disc I – seven from musicals with words by Oscar Hammerstein (1, 8, 10, 13, 21, 25 and 28), and the other three representing collaborations with lyricist Larry Hart (5, 15 and 23). Other multiple tracks come from the pens of Fritz Loewe (4, 14 and 22), Cole Porter (6 and 18), George Gershwin (16 and 21), and Noel Coward (9 and 24). 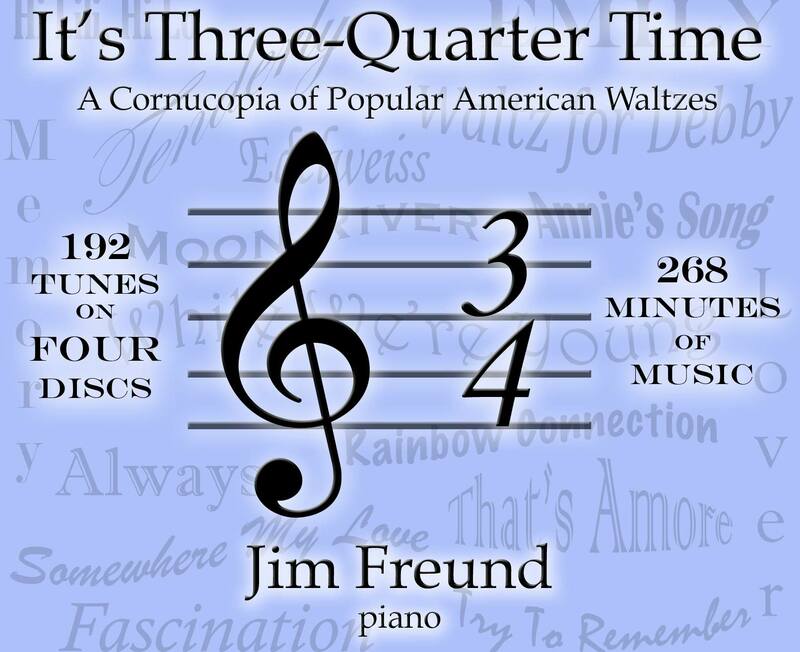 On Disc 2, which features my favorite waltzes, Irving Berlin composed three of them (1, 26 and 30) in a two-year period. Almost half of the entries are from the ’60s (4, 7, 8, 9, 10, 19, 21, 25 and 27) and ’70s (2, 12, 17 and 23) – more than from the musical decades of the ’30s and ’40s that I usually embrace. My mother, who has just turned 102, is particularly fond of the message contained in Burt Bacharach and Hal David’s What the World Needs Now is Love (27), which she has performed publicly on several recent occasions. Disc III contains 31 medleys of 82 songs, mostly from the early years of the 20th century. (The ones beginning at track 22 are of a later vintage.) The liner notes to the album contain some examples of the various rationales I used in pairing particular entries. On Disc IV, there’s some Strauss (20) and Puccini (25) – classical music from a fakebook – a little Gilbert and Sullivan (14), but there’s also Paul Simon (1), Bob Dylan (28), and some of their contemporaries (5, 8, 12 and 24). Included are Italian (3) and Irish (9) melodies, as well as American folk songs (23) and ragtime (13 and 29).